If your kiddos love crafting and creating cute projects that involve blossoms, petals and tons of color, they’ll love this HUGE list of fun and easy flower crafts! And trust me, only the best of the best made this list! Spring, summer and Mother’s Day all make me want to pick, plant and craft some cutesy flowers. My kiddos are exactly the same. They are constantly drawing flowers and rainbows! I love how all the bright colors add instant cheeriness to our home! Let’s all add some cheeriness this week. Which craft will you make? My friend Michelle at Crafty Morning never ceases to amaze me with her adorable craft for kids. Hop on over to her website and check out these cute paper plate flowers! Did you know cupcake liners weren’t just for baking? Check out this fun and easy flower craft that’s made from your fave cupcake liners! This fingerprint poppy flower craft always makes me smile! Craft and learn with Sparkly Flower Craft. My daughters love pens. This Flower Pen Craft will be a hit! Go grab your pom-poms! I feel some Pom pom Flower Painting fun coming on! Display those cute footprints with this Flower Pot Footprint craft. Aren’t these Rolled Paper Flowers gorgeous? Hey — you did save that tissue paper from the birthday gifts — right? Good. Now you can create these Tissue Paper Flowers! What’s crafting without Popsicle sticks? Love this Flower Craft that’s made with my fave crafting supplies! Get ready to decorate with Flower Garland. More gorgeous Tissue Paper Flowers coming up! Cute, cute, cute are the only words to describe this Accordion Paper Flowers Craft. Doilies make the cutest flower crafts. Have you made salt dough yet? Start with these Salt Dough Flower Fingerprints. 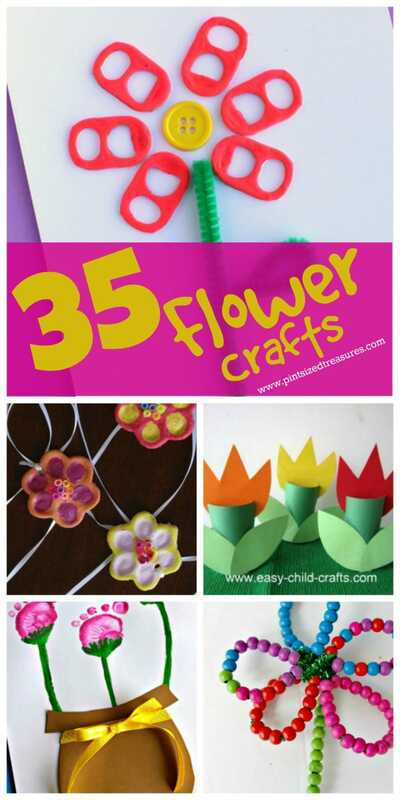 Easy-peasy is exactly what this flower craft for preschoolers is! Paper flowers are just too cute in this Kid Flower Craft. Any Fruit Loops fans out there? You’re kids will enjoy this yummy Fruit Loop Flower Craft. Psst! Don’t eat all the materials before you craft, k? Wink, wink! How fun are these DIY Sirly Paper Flowers? Tulips are my fave flower of all time. No wonder I love this Tulip Flower Craft! We have spools of yarn around the house. This Yarn-wrapped Tulip Craft will be a cinch to make! 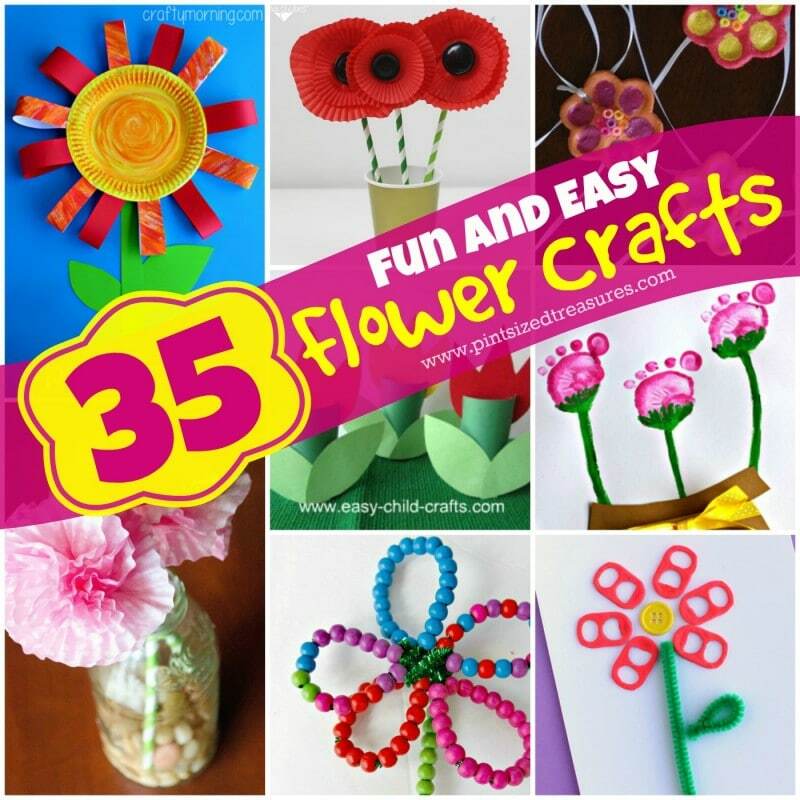 Focus on fine motor skills while your child creates this Fine Motor Skills Flower Craft. Grab your squeeze pouch lids to create this Adorable Flower Craft. More paper flowers on the way with this Cupcake Liner Flower Craft. Poppies scream “SPRING!” in this Cupcake Liner Poppy Craft. Dress up the play room or nursery with this Easy Poppy Bunting. Keep it simple with this Printable Spring Flower Coloring Craft. How cute are these Bubble Paint Flower Hydrangeas. Up-cycle the fun way with this Soda Bottle Flower Craft. Got any cupcake liners left? Here’s another fun Cupcake Liner Flower Craft. Let your child make home-made cards with this simple Soda Pop Tab Flower Card Craft. Buttons, corks and paper make this cute Stamped Flower Craft. Pretty flowers make up this Paper Bag Tiara Craft. Do you love crafts or want to learn more about crafting? Check out this amazing homemaking resource that includes lots of diy projects, crafting ideas and more. And yes, when you sign up for your homemaker bundle you get the above Craftsy deal as an added bonus — for free! But, that’s not the ONLY free bonuses you get! So, hurry and check out this amazing resource for crafting moms that’s only available until 4/27 ad midnight EST!